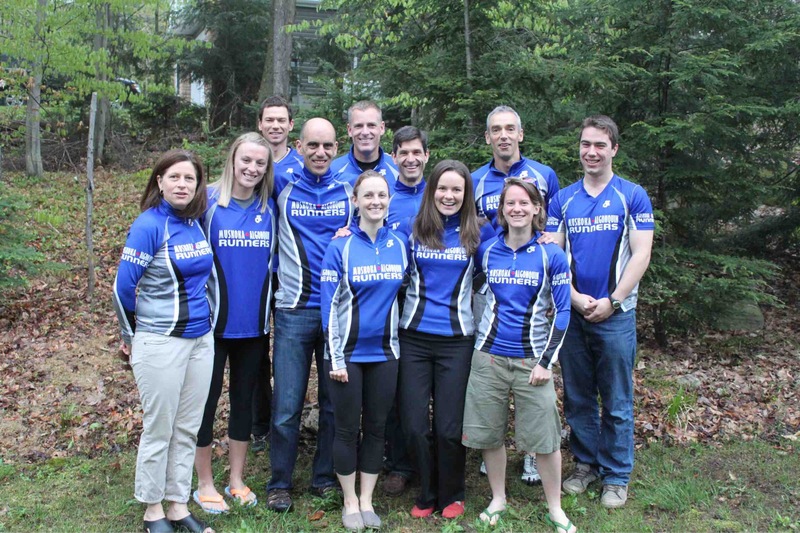 Muskoka Algonquin Runners (MARS) made a statement May 25, qualifying 8 out of 8 runners for the 2015 Boston Marathon. Martina Morton ran a personal record (PR) in the Ottawa Marathon in 3:10 on a warm day. She accomplished this feat a mere 10 months after giving birth to her son, Hudson! Martina is a (former) member of the Newmarket Huskies but may have traded in the yellow of the Huskies for some Muskoka blue and red! Meanwhile, a group of 11 MARSians journeyed to beautiful Burlington, Vermont for the Vermont City Marathon and Marathon Relay. MARS entered two relay teams and 7 marathon runners in the event. The Boston Marathon typically accepts 2400 Canadians and 8 of them will represent Muskoka Algonquin Runners in 2015. There were 8000 runners at the race, just under 3000 in the marathon. Katherine Ahokas lead the way as the 9th woman and 82 overall. Troy Cox, Mark Sinnige and Pierre Mikhail were 2,3,4th out of 175 in their age groups and 53,54,and 67 overall. Lowell Greib was 105th overall and 13/109 in his age group. Jessica Sheppard was 7/231 in her age group and 136 overall. Dave Johnstone placed 23/175 in his age group and 237 overall. In the relay even the team of Cam Raynor and Kip Arlidge came 15th out of 927 teams. The team of Wendy Shirtliff and Tina Steele came 178 out of 927 teams!!!!!! Finally, MARS placed second overall in the marathon team event. Once this result is officially confirmed the team will win $300 in prize money which it will put towards club programs. MARS will take a short break this week before launching it’s summer program in June. Through the first three weeks of June we will meet Tuesdays at 6:30 am and Saturdays at 7:30 am for easy runs (post marathon recovery). It’s a good time to see what we are all about. Details can be found at the club’s website Calendar tab at http://www.muskokaalgonquinrunners.com. Our summer program starts Tuesday June 24. Tuesdays workouts will be 6-8 pm at Conroy Park and Thursdays/Saturdays 6:30 am. Details at Calendar tab. The next Run To The Pub event will be Thursday June 26. Meet at River Mill Park at 5:30 pm to run and/or in the Pub at 6:30 pm afterwards. This date also marks the first summer Thursday 6:30 am workout at Conroy Track. Come to one, come to both! MARS welcomes anyone interested in becoming a better runner, regardless of current running ability. Currently the club supports a women’s running clinic lead by Katherine Ahokas at The SportLab, an 8 week running clinic for kids in grades 6, 7 and 8 and a summer running camp in Craftsbury, Vermont for high schoolers. Who won the 2012 Olympic Men’s 5000 and 10,000m races? And who was/is his coach? Best two answer(s) will win a free entry to the race.